You probably are following the react native tutorial here. When you past the code from the hello world example here your registered component name is not matching since you first one was AwesomeProject and the new one is HelloWorld. 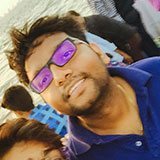 Previous Post« Previous Why Flipkart Affiliate Program Cannot be trusted, and why I will never use it again. Yes, this is very common with almost any new framework,tool, language when you don’t know what is what. Thank you! This was definitely helpful. Run npm start on local machine to start the development server. React Native relies on a development server to communicate with the app running in the simulator. close terminal and again start teminal. Great man, helped me out a lot, thanks for this!